Frequency distribution of age groups is shown in [Figure 1]. The mean age of the patients with positive HSV-1 DNA test was 42.67 ± 34 years and those with negative tests was 41.94 ± 22 years without any significant difference (P = 0.96). 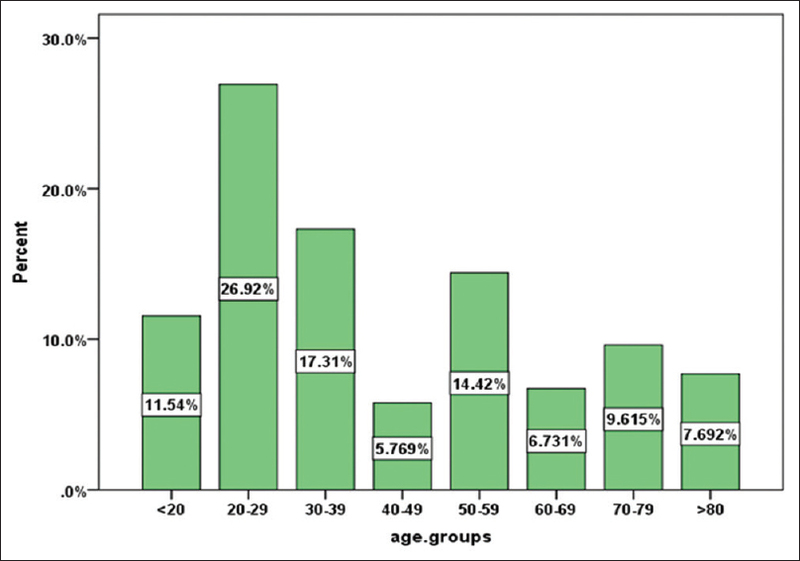 Among three patients with positive HSV-1 DNA test, two were in the age group of 20–29 years and one in the age group of ≥80 years [Figure 2]. All three positive cases were male. Behzad-Behbahani A, Abdolvahab A, Gholamali YP, Roshanak B, Mahmood R. Clinical signs as a guide for performing HSV-PCR in correct diagnosis of herpes simplex virus encephalitis. Neurol India 2003;51:341-4. Shoji H, Koga M, Kusuhara T, Kaji M, Ayabe M, Hino H, et al. Differentiation of herpes simplex virus 1 and 2 in cerebrospinal fluid of patients with HSV encephalitis and meningitis by stringent hybridization of PCR-amplified DNAs. J Neurol 1994;241:526-30. Tyler KL. Update on herpes simplex encephalitis. Rev Neurol Dis 2004;1:169-78. Tafreshi NK, Sadeghizadeh M, Amini-Bavil-Olyaee S, Ahadi AM, Jahanzad I, Roostaee MH, et al. Development of a multiplex nested consensus PCR for detection and identification of major human herpesviruses in CNS infections. J Clin Virol 2005;32:318-24. Jeffery KJ, Read SJ, Peto TE, Mayon-White RT, Bangham CR. Diagnosis of viral infections of the central nervous system: Clinical interpretation of PCR results. Lancet 1997;349:313-7. Whitley RJ, Kimberlin DW. Viral encephalitis. Pediatr Rev 1999;20:192-8. Alarcón F, Moreira J, Rivera J, Salinas R, Dueñas G, Van den Ende J, et al. Tuberculous meningitis: Do modern diagnostic tools offer better prognosis prediction? Indian J Tuberc 2013;60:5-14. Sauerbrei A, Eichhorn U, Hottenrott G, Wutzler P. Virological diagnosis of herpes simplex encephalitis. J Clin Virol 2000;17:31-6. Ziyaeyan M, Alborzi A, Borhani Haghighi A, Jamalidoust M, Moeini M, Pourabbas B, et al. Diagnosis and quantitative detection of HSV DNA in samples from patients with suspected herpes simplex encephalitis. Braz J Infect Dis 2011;15:211-4. Domingues RB, Fink MC, Tsanaclis AM, de Castro CC, Cerri GG, Mayo MS, et al. Diagnosis of herpes simplex encephalitis by magnetic resonance imaging and polymerase chain reaction assay of cerebrospinal fluid. J Neurol Sci 1998;157:148-53. Domingues RB, Lakeman FD, Mayo MS, Whitley RJ. Application of competitive PCR to cerebrospinal fluid samples from patients with herpes simplex encephalitis. J Clin Microbiol 1998;36:2229-34. Heitman J. Mandell, Douglas, and Bennett's principles and practice of infectious diseases. Mycopathologia 2000;149:47-8.